AS SHOWN Lewis pair of dining chairs. 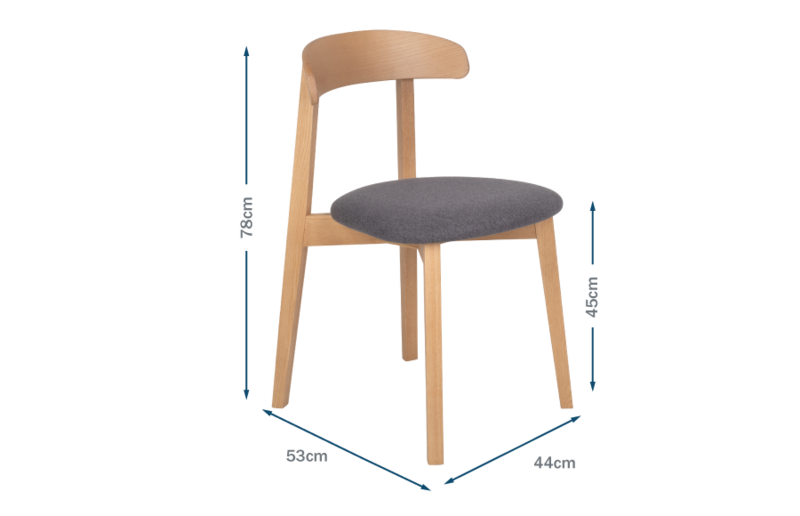 Featuring a contemporary design, the Lewis dining chair has a curved backrest for comfort and support whilst the pebble-shaped seat creates a modern aesthetic. The elegant and ergonomic backrest and the crisscross frame are made from solid ash and ash veneers and are complemented by grey wool felt upholstery. These chairs sit beautifully with many oak tables within our collection of dining tables. Made in Italy by skilled craftspeople. Ergonomic curved backrest for comfort and support. Pairs beautifully with our oak dining table collection. Please note these chairs are sold in pairs, the price shown is the price for 2 dining chairs. Made of solid ash and ash veneer the colour of the Lewis chair is matched to oak to compliment our dining table collection. Pebble shaped seat creates a modern aesthetic. Curved ply back rest to offer comfort as well as style. solid ash and ash veneer. Joshua Fabric: Martindale Rub Count: 30,000. Composition: 100% Polyester. Clean with a water based product such as foam from a mild detergent such as upholstery cleaner, use sparingly and avoid over wetting, always blot never rub. Frequent light brushing and vacuuming is recommended.